PHUKET: Police are currently hunting for a shooter and his accomplices who shot a man dead on his doorstep in Rassada last night due to what police believe was a personal dispute. Lt Col Taksin Pinyotheppratan of the Phuket City Police was notified of the incident at 8:50pm yesterday night (Mar 4). Phuket City Police Chief Col Kamon Osiri, Deputy Chief Lt Col Chao Phomna and Forensic Police’s Lt Col Kittasak Choophueng arrived at the scene, a two-storey property in the Rang Siri housing estate in Moo 3 Rassada, the lower floor of which was used as a tattoo parlour, to find two pools of blood on the floor. Two 11-millimetre bullet casings were found on the floor nearby while a third was found behind a sofa inside the house. Police were told that two males, Sinchai Kaewliporn, 30, and Jakkapan Saluaiieam, 28, already had been taken to Vachira Phuket Hospital in Phuket Town. Mr Sinchai sustained three bullet wounds across hsi chest and was later pronounced dead while Mr Jakkapan had also sustained a serious injury. Col Kamon said, “Mr Sinchai, Mr Jakkapan and two to three other friends were fixing Mr Sinchai’s car right outside of his house when another group of men pulled up in a black Mitsubishi Pajero followed by a big bike. “The gunman exited the car and asked for Sin,” Col Kamon explained. 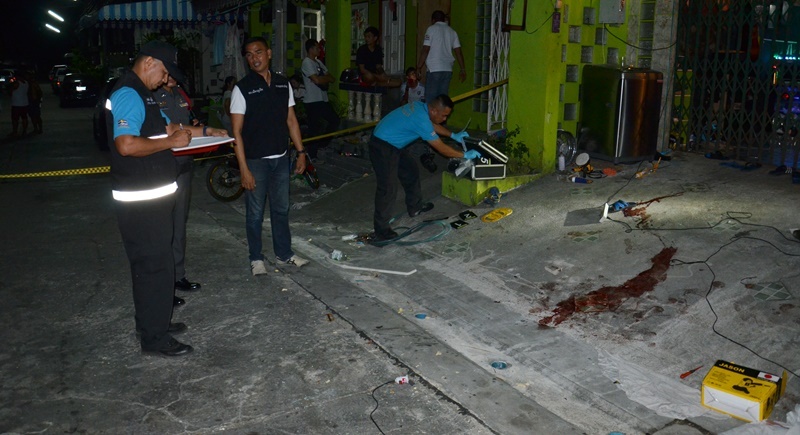 “The gunman then shot Mr Sinchai at close range while his friends ran away. “Mr Sinchai managed to get inside the house but the gunman followed him and fired another shot which missed Mr Sinchai but hit Mr Jakkapan. The gunman and his accomplices then sped away. “Mr Sinchai was taken to the hospital by his friends,” Col Kamon said. “At this stage we believe the murder took place due to a personal dispute but we cannot specify what that dispute was over. “We are continuing the investigation and will check CCTV from the area to hunt for the suspects as fast as we can. This is a serious crime,” Col Kamon added.